You asked for it, and we delivered! 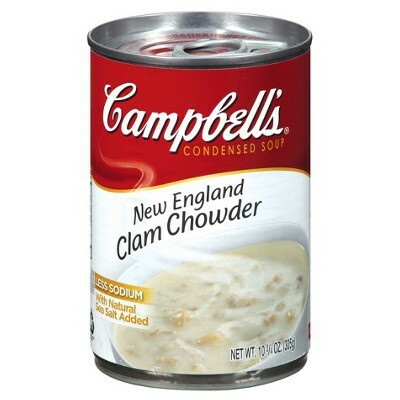 Now you can enjoy a delicious bowl of Campbell's best-loved soup, New England Clam Chowder, without having to go to the States to get it! Creamy, hearty, and clammy (but in a good way! ), this Campbells creation will win over the whole family. Pick up a can of fish chowder today, and don't forget to check out the rest of our selection from Campbell Soups! clams stock, potatoes, water, clams, modified food starch, wheat flour, less than 2% of: vegetable oils (corn, cottonseed, canola and/or soybean), salt, flavor enhancer E621, yeast extract, antioxidant E339, thickening agent E508, flavoring, cod flavor (fish), clams extract, acidity regulator E363, sugar, soy sauce (soybean, wheat, salt). Contains GMO. Nutrition facts (for 100ml): calories 75Kcal, total fat 2.1g (saturated fat 0.4g), total carbohydrate 11.7g (sugar 0.8g), protein 2.5g, salt 1.6g. El sabor de la sopa es muy bueno, las papas y las almejas escasean. Para nada corresponde a la imagen que aparece en el envase que muestra abundancia estos ingredientes. N.E. Clam Chowder is something I have searched for in vain for 21 years. Please keep it in stock. Buona la zuppa e ottimo il servizio di spedizione. Grazie e ricordate di rifornirvi spesso: è quasi sempre esaurita! I discovered Clam Chowder in Boston, enjoyed it again in Auckland, and then....fini!! Could not find it anywhere... Until I found the American Market, here at home, in France !! Yummy!! Livraison rapide pour ce très bon produit.